According to a recent report by the Centers for Disease Control and Prevention, more and more Americans are choosing alternatives to traditional health insurance plans, including high-deductible health plans with HSAs. 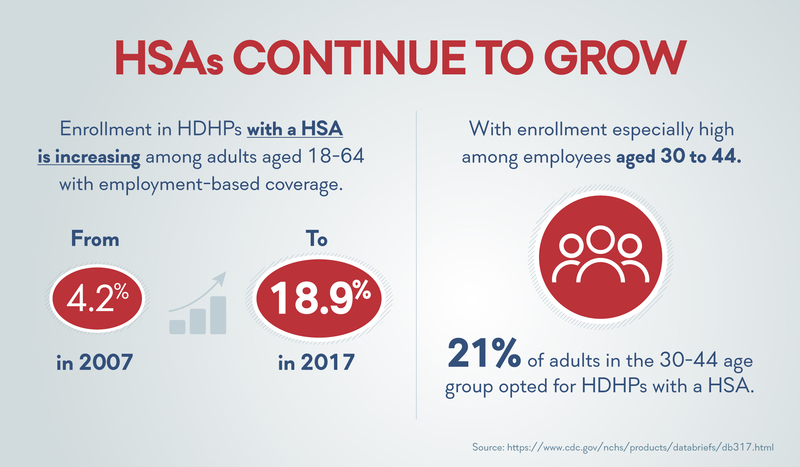 In the past 10 years, enrollment in high-deductible health plans (HDHPs) with a health savings account (HSA) increased among adults aged 18–64 with employment-based coverage, from 4.2% to 18.9%, while enrollment in traditional plans decreased. 21% of employees aged 30 to 44 enrolled in a HDHP with a HSA, making it a competitive benefit option to help attract and retain key talent. It’s easy to understand why employers and their workforce are making the switch. There’s a big appeal to HDHPs, as individuals with HDHPs pay lower monthly premiums but pay more out of pocket for medical expenses until their deductible is met. That’s where HSAs come in. Individuals can use the pretax income saved in their HSA to pay their deductible costs. The combination of Call A Doctor Plus and HSAs can provide significant cost savings for clients and their employers. Legislation passed recently by the House would expand the use of HSAs even further and treat certain over-the-counter drugs as qualified medical expenses. HDHPs encourage individuals to choose the best value – something we understand very well. That’s why we offer Telehealth services with a $0 co-pay plan design. With our proven platform, plan members are able to connect with doctors and other health professionals 24/7 via phone, video or app, helping them avoid unnecessary healthcare spending, such as the co-pay for an in-office physician visit or the high costs of a trip to the ER – making the decision to offer Telehealth services alongside a HSA plan even more appealing.